Srinagar, Aug 13 (KNS): Terming the ongoing spree of arrests and nocturnal raids as ‘most undemocratic’, Joint Resistance Leadership (JRL) comprising Syed Ali Geelani, Mirwaiz Umar Farooq and Muhammad Yasin Malik has said that from southern districts of Kashmir to northern districts and central Kashmir, a spree of arrests is going on unabated and thousands of young and old are being put behind bars and tortured physically and mentally. JRL in a statement issued to KNS said that some months back, DG of police issued a statement and urged upon warring parties to not involve families into their hostilities. “Even JRL at that time echoed same assertions and urged everyone spare families. But today villages, towns and localities of Kashmir especially in southern districts of Kashmir are witnessing a reign of fresh arrests wherein family members of those in armed and political struggle are being arrested, tortured and humiliated by police, SOG and other occupational forces,” they said. JRL said that scores of family members of those in resistance have been arrested from Tral, Pulwama, Shopian, Kulgam, Bijbehara, Sonawari and other areas and are being tortured, beaten and humiliated in lockups by police, SOG and other forces, which is exactly opposite to the views expressed by DGP and are highly condemnable. They said that Kashmiris ‘abducted’ by NIA and lodged at Tihar Delhi are also facing same torture. “Syeda Asiya Andrabi, Fahmida Sofi and Naheeda Nasreen who were recently shifted to this Jail have been put into different cells where they are not even allowed to walk for some minutes,” they added. The leadership said that these ailing ladies are being provided eatables in polythene bags and their request to get some plastic plate or mug have been rejected by jail authorities. “Similarly in other barracks where Syed Shabir Ahmad Shah, Altaf Ahmad Shah, Shahid-ul-Islam, Ayaz Akbar, Peer Saif-u-ullah, Raja Meraj-u-Din Kalwal, Nayeem Ahmed Khan, Farooq Ahmed Dar, Zahoor Ahmad Watali, and Shahid Yousuf Shah, Muhammad Aslam Wani, Muzafar Ahmad Dar have been kept, water scarcity, lack of electricity in these hot months, lack of medicines and poor quality of food has made lives of inmates miserable. Likewise Kuthowa jail, Udhampor jail, Kot-balwal jail, Hira-Nagar jail, Srinagar central jail, Jammu Amphala Jail and other jails have been turned into worst concentration camps where inmates are tortured, beaten, put in solitary confinements and humiliated at daily basis,” they said. JRL said that Kashmir is a police state every kind of political dissent is being crushed with military might. “Recently uncle of incarcerated Muslim league chairman Masart Aalam who is in jail from 2010 and uncle of Sarjan Barkati who is in jail from 2016 breathed their last neither Masarat nor Moulana Barkati where allowed to join their funeral or burial,” JRL said. “Even convicts are allowed to join bereavement of their kith and kin but such is the cruel attitude of Indian rulers and their Kashmiri stooges that normal procedures are undermined by authorities,” they added. They said that thousands of young and old are these days being called to police stations, arrested and put behind bars. “This is being done in the name of Independence Day of India which is actually ridiculous,” they added. They said that as Eid ul Azha is approaching, this spree of arrests has taken an ‘ugly turn’ and at a time when families of inmates are expecting the release of their dear ones, jails and police stations are being filled up with more and more Kashmiris. 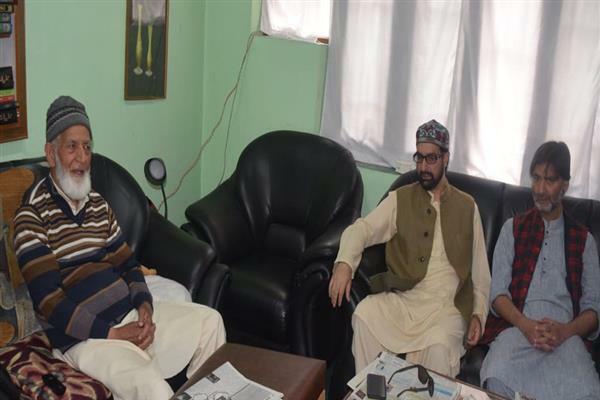 JRL said that persecuting families of opponents is nothing but cowardice and spree of arrests and imposition of hardships on those in jails for holding a political view contrary to that of the rulers can only be termed as ‘despotism’. They said that Kashmiris want these innocent political victims to be released from jails soon so that they are also able to celebrate Eid with their families. “These inmates are actually rendering sacrifices for the sacred cause of freedom and self-determination and we want to assure them that the struggle for achieving our right to self determination will continue till the goal is achieved,” JRL said.